You've found the “U.S. Saxony Duck Breeders” page here at Hobby Farm Wisdom! If this is the first time you have visited our site: Welcome! Saxony ducks originate in Germany and are considered a heavy duck that can weigh up to 8 or 9 lbs. They have a long and compact body and a prominent chest with an upward stance. The drake’s head, back and wings are blue-gray with markings similar to the Mallard. The breast is a chesnut-burgundy color and flanks are cream with a white neck ring. The legs and feet are orange or reddish-brown and the bill is yellow or orange. Females are buff with creamy facial stripes, neck ring and underbody. These ducks are active foragers and great layers, producing up to 240 large white eggs annually. 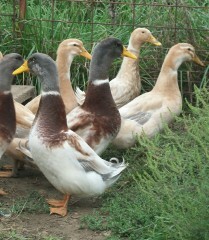 Their meat has more flavor and less fat that many other ducks and are considered an adaptable all purpose breed.